It’s no secret, I LOVE getting mail. Well, not ALL kinds of mail…you can keep the bills. Those are yucky and make my wallet go *cough, cough* as Jacey would say. But cards, letter and packages…yeah, I am all over that. So, you can imagine that when the opportunity presents itself for me to get mail, I jump on it (sometimes, much to Bry’s dismay :). 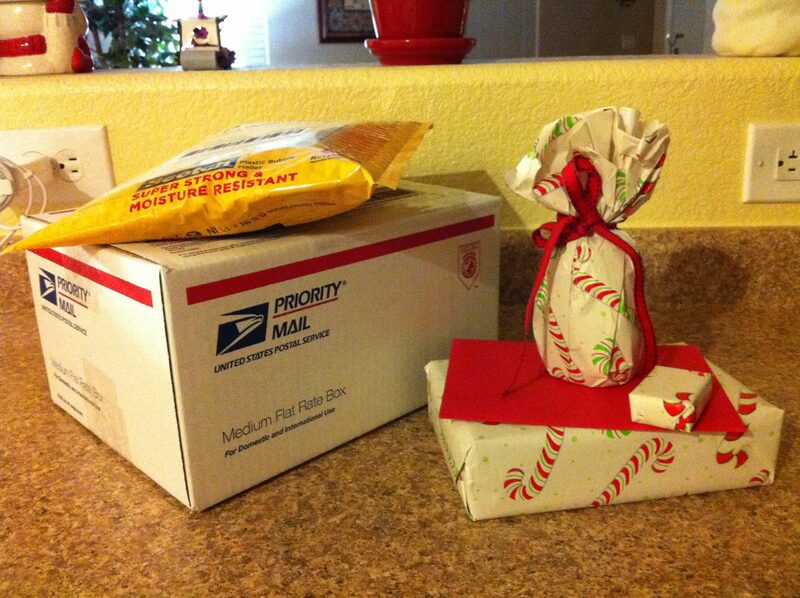 This year, I signed up for a MilSpouse Secret Santa exchange and an ornament swap. My secret santa was on the ball. I got my gifts from her this past week. Thank you so much “Sespi”! I haven’t opened the gifts yet, but we were all over the truffles and the brownies…yum! Mine on the otherhand weren’t ready to go out until last night. They are now all packaged up and waiting on the mailman to pick them up for me. Sorry, no way I am braving the post office….I did that last week and almost didn’t make it out alive! So, all you out there that signed up but haven’t gotten your goodies yet, keep your eyes open…they just might be from me!